Wayne Hartley, Manatee Specialist, and Cora Berchem, Manatee Research & Multimedia Specialist, take “manatee roll call” at Blue Spring State Park. The first manatee I saw as I launched the canoe was our Club adoptee Gator. He was accompanying a cow/calf pair. The river temp was 68° F (20° C). There was a total of five manatees seen. Tomorrow may be the last roll call of the season. On Monday, the river temp was 69° F (20.5° C). Seven manatees were seen but none were Club adoptees. Today the river temperature was 67° F (19.5° C). Eleven manatees were seen but, again, none were Club adoptees. Not much today. The river temp was 69° F (20.5° C). One of our unknown manatees was just entering the run as I started but when I came back down the run he had already left. At least Cora got to see Phyllis and her calf yesterday! The river temperature stayed at 19.5° C (67° F) and only 18 manatees were in this morning. However, Save the Manatee Club adoptee Merlin surprised us with an unexpected late season visit! Although we had heard from fellow researchers that he was seen at other springs this winter season, it was his first visit to Blue Spring. We are thinking that Merlin may be one of the manatees who is spending the summer south of Blue Spring, as he oftentimes stops by very late in the season, maybe on his way south. Or he heard that our enewsletter with the latest adoptees sightings is about to go out, and he wanted to be included. It was good to see him. Click here to see a photo of Merlin from his March 30th visit to Blue Spring. It was very much like yesterday with the manatees moving all about. The river was still 67° F (19.5° C). The roll call count was 36 manatees. Quite a few came in after roll call, so I ended up with 41 ID’d. No Save the Manatee Club adoptees for the roll call, but on the way back down the run I found Gator harassing some poor female and then Lily with her crowd of young males near the river. Tuesday Cora went out and counted six manatees. None were Club adoptees. On Wednesday, wind and rain predictions caused a cancellation. Today the river temp was 67° F (19.5° C). I counted 30 manatees and ID’d 28. It was not easy. The majority of the manatees were swirling around the mouth of the run, so I felt I was in the middle of a carousel and ID’s were difficult! None of the manatees present were Club adoptees. Another sad note: Amigo, BS275, was found dead of natural causes in the Indian River near Scottsmoor, Florida. Amigo was a male manatee first recorded at Blue Spring on November 23, 2000. After that, he was only seen seven other seasons but was always fun to see. The river temp today was 66° F (19° C). I counted 16 manatees and most of them were hanging out with Club adoptee Lily just barely inside the run. Over the weekend the river temp was 64.4° F (18° C). Cora saw Club adoptees Gator, Lily, and Aqua and calf. Even better, Lily’s daughter Lillith brought in a brand-new calf! The counts were 41 manatees on Saturday and 46 on Sunday. On Thursday, the river temp was back to 68° F (20° C). We counted 48 manatees and ID’d 39. Our Club adoptees in were Lily, Nick, Howie, and Doc. On Friday, Brutus was in!! I only saw him for a few seconds, but it was him. The river is still 68° F (20° C), and manatees are all over the mouth of the run and the river in front it. I counted 43 manatees, and I am sure there were many more. I ID’d 31, and beside Brutus, the Club adoptees were Flash, Gator, and Howie. Beautiful day today. Unlike yesterday when I waited an hour for the rain to let up. Then, half way up the run, the rain started again. Today it was just windy. The river temp was 67.6° F (19.8° C), and the official count was 15 manatees — just like yesterday. We stayed on the run to attempt a capture, but the manatee was healthy enough to avoid it. By the time we finished, we had ID’d 37 as more and more manatees kept coming in. Three were Club adoptees: Howie, Lily, and Flash. Howie made the official roll call. This was Flash’s first appearance at Blue Spring this season! Now if only Brutus and Merlin would drop by to say hello. If you missed it, we do know where they are staying the winter — in another spring. The past few days manatees have been seen from time to time by park staff, but none were ID’d. Today the river temp was 68° F (20° C), and I counted 15 manatees. Of those, 13 were ID’d but none were Club adoptees. The high air temp today is predicted to be 68° F, so the river should be colder tomorrow and the count even higher. This afternoon, Cora spotted Save the Manatee Club adoptee “Phyllis” on the webcam with her calf around 1:30. Our only manatee today was S118/18. He rushed to the canoe as if he was lonely. The “S” means seasonal, as in I do not think I will be able to ID it after this season. It was the 118th manatee of that description this season (2018-19) indicated by the 18 after the slash. The river temp was 71° F (22° C). The river temperature was 69° F (21° C) and no manatees were seen. This could be the end of the season. On Thursday, the river dropped five degrees in 24 hours to 63° F (17° C). The park staff, counting early and hampered by mist on the water, counted 15 manatees. With the mist burned off and more manatees coming in, my official count was 51 manatees. I was accompanied by Channel Nine, and we continued an interview and filming after the offical count as more manatees came in. I ended up seeing 63 manatees and ID’d 38. Howie was the Club adoptee present, and he even made roll call! On Friday, the river temp was 64° F (17.5° C). We counted 69 manatees at roll call and five more that came in late. Howie, bless his heart, was one of the late arrivals and the only Club adoptee. Now we go back to summer weather. The river temp was 68° F (20° C). The park staff counted six manatees, and we counted two. Then, with the roll call over and the wind letting up a little, we found 10 manatees that had just come in from the river. Four manatees were ID’d, but none were Club adoptees. The river temp had gone up by half a degree to 68.9° F (20.5° C) and four manatees were in. Three of them were identified, but none were Save the Manatee Club adoptees. Over the winter time we have been monitoring a manatee with some fungus scarring on its tail. Since we didn’t know it, we gave it the number “U117/18,” which means by the end of the season it will get a Blue Spring name and number. The manatee was in again today, and the fungus has “eaten away” two parts on each side of the tail. So, sometimes scarring can happen from other causes than boat strikes. However, the same manatee also got a new boat strike this past month, now making it even more identifiable. Some cooler weather is predicted for next week, so maybe we will see some more manatees. The river temp today was 68° F (20° C). Yesterday, 10 manatees were on the webcam in the afternoon. Today, the count was one, then a cow/calf pair joined up after the count was over. No Club adoptees were present. Maybe next week. I did see the Pied-billed Grebe. It is a very small diving bird. Most of the diving birds in the run are larger and more abundant. About four weeks ago, I mentioned to Cora that I had not seen the grebe this season, and minutes later, as we came out of the boil, there it was. We saw it every day for a week and a half, and then it was gone again. I know it is a manatee blog, but the grebe is cute and makes me happy. The river temp was 71.5° F (21° C), and no manatees were present. Yesterday the river was two degrees warmer and the count was also zero, but at least Cora saw four manatees playing in the middle of the river. The river is up to 70° F (21° C). There were no manatees for the count or after the count. This is what days of highs in the mid-80s and lows in the mid-60s does. It appears these temperatures will continue for a few days at least. Now the river temperature has reached 68° F (20° C). I counted two manatees, but three more came in after the count was over. Four manatees were ID’d and none were Club adoptees. Summer temps seem to be continuing. The river temperature was up to 66° F (19° C) today. The count was eight manatees, but we saw seven more after the count was over. We ID’d 12 manatees, but none were Club adoptees. The river temperature dropped to 62.6° F (17° C). The park staff counted 55 manatees, and I counted 79. Of those, 64 were identified and among them were Save the Manatee Club adoptees Una and Gator. Una is still being monitored for new entanglements to her flippers. She is a good reminder how important it is to properly discard monofilament fishing line so manatees and other wildlife won’t get entangled in it. Most manatees were in the lower transects of the spring run close to the St. John’s River. They probably feel that it is warming up again, and they are eager to go out and feed. The river temperature dropped a bit more to 64.4° F (18° C). The park counted 40 manatees, and I counted 48. Some manatees seemed to just be coming in from the river as I started the count and more seemed to be coming in as I was finishing up the count. Of those, 31 manatees were ID’d, but none of them were Save the Manatee Club adoptees. Venetia, a manatee who was rescued in 2016 and released at Blue Spring in early 2017, brought in a calf this season. The pair was in the spring run today. It’s nice to see her doing so well and having made Blue Spring her winter home! The river temp was down a bit to 67.7° F (19.9° C). The manatee count was 10, all of them were ID’d, but none were Club adoptees. I counted between the rain showers. The river temp was 68° F (20° C). The count was two manatees. Neither was a Club adoptee. One was Buckeye, a manatee we’ve been watching as he appeared a bit poorly. It was decided to give him a more thorough physical than could be done in the spring run. We, along with the Florida Fish and Wildlife Conservation Commission, SeaWorld, Sea to Shore Alliance, and Florida Park Service staff captured him, and he is off to SeaWorld for a checkup. Hopefully it will be a short stay. Once Buckeye was in the boat and on his way, five manatees came in, but the winds had gone from calm to 15 mph, and they could not be ID’d. The river temp is up to 62.8° F (17° C). The number of manatees counted remained at 50 and Floyd was the only Club adoptee in again today. The park’s Citizen Support Organization was doing a guided walk along the run. They were able to listen in as we did the count and even ask questions. They seemed to enjoy it. The river temp was 60.8° F (16° C). I counted 50 manatees. The only Club adoptee present was Floyd. The river went up another degree to 60° F (15.5° C), and the number of manatees counted went down by 62 to 119. However we were able to add Una to the Club adoptees sighted, along with Annie and calf and Floyd. What a difference two days make. The river is up five degrees to 59° F (15° C), and the manatee count is down from 412 to 181. Of those, 97 manatees were ID’d. The only Club adoptees were Annie and calf and Floyd. The river temp was down to 54° F (12° C). I was accompanied by Spectrum News 13 doing a film interview, so the count was not the best, but I did see at least 412 manatees. Of those, 248 manatees were ID’d. Club adoptees Nick, Howie, Lenny, Doc, Deep Dent, Philip, Paddy Doyle, Floyd, Gator, Whiskers, Rocket, and Aqua and calf were at home. On Wednesday, the river temp was 55.4° F (13° C). We counted 553 manatees, a new record by about 70. We ID’d 259 manatees, including Club adoptees Nick, Howie, Lucille, Paddy Doyle, Annie and calf, Floyd, Lenny, Deep Dent, Lily, Philip, Whiskers, Phyllis and calf, Gator, Moo Shoo, and Aqua and calf. Cora checked on the female calf whose rescue she initiated earlier in the season. The calf is doing well at SeaWorld Orlando and loves her bottle. As the season goes on and so many manatees come in I really begin to wonder about the missing. We had at least eight very well marked manatees we had not heard from. Now we know what happened to Zeb, BS362. With the federal government back at work, we were notified by USGS Sirenia Project that his remains were recovered in Norris Dead River west of Deland on November 8, 2018. Zeb came into Blue Spring as a very battered orphan calf in 2003. He was adopted by a female named Bread who must have lost a calf in the off season. She not only nursed Zeb through the season but still had him with her in the 2004-2005 manatee season. Zeb’s cause of death could not be determined. On Thursday, the river temperature was down to 51.8 ° F (11° C), and the manatees piled into the spring run to keep warm. 489 manatees were counted and 227 identified. Adoptees Annie, Aqua, Philip, Phyllis, Howie, Nick, Lenny, Doc, Deep Dent, Paddy Doyle, Una, Rocket, Gator, Floyd, Lily, Lucille, Whiskers, and Moo Shoo were in! The river temp was 56.5° F (13.8° C) today. Cora was off helping rescue a cold-stressed manatee, so I went it alone. I counted 419 manatees, and the park staff counted 452. As the wind was down and the manatees were not stirring up so much clay, I ID’d a whopping 238 manatees. The Club adoptees in that number were Lucille, Una, Moo Shoo, Gator, Lily, Phyllis and calf, Aqua and calf, Annie and calf, Deep Dent, and Whiskers. The river temp was 55° F (12.8° C). We counted 438 manatees, and the park staff counted 466 manatees. Of those, 193 manatees were ID’d. The adoptees were Howie, Lucille, Nick, Philip, Paddy Doyle, Lenny, Deep Dent, Lily, Doc, Gator, Aqua and calf, Gator, Phyllis and calf, Annie and calf, Whiskers, and Rocket. Quite a good showing. I’d like to make a comment on Margarito. He goes off somewhere after appearing at Blue Spring and then disappears for most of the winter. I would love to know where he goes. Day 1 of the Manatee Festival and the manatees piled into the spring run! Luckily the wind had led up a little bit, which made counting and identifying a easier. The river temperature was 59° F (15° C). The park counted 309 manatees, and Save the Manatee Club counted 318. Of those, 183 manatees were ID’d, among them were adoptees Lily, Whiskers, Lenny, Paddy Doyle, Nick, Philip, Una, Moo Shoo, Annie, Phyllis with calf, Rocket, Aqua with calf, and Gator. The river temperature was 60.8 ° F (16° C) today. The park staff counted 212 manatees, and Save the Manatee Club staff counted 205. The wind made counting — and especially IDing — very difficult, but adoptees Annie, Phyllis with her calf, Moo Shoo, Philip, Lily, Aqua with her calf, Una, Gator, Rocket, and Floyd were seen. With the count over, Paddy Doyle showed up, too. Hopefully the wind will calm down a bit for the weekend, as it is supposed to stay cold for the Blue Spring Manatee Festival, and we hope to see a lot of manatees and adoptees! Yesterday we went up 100 manatees. Today we went back down 100 manatees. The river temp was the same as yesterday, 58° F (14° C), but the clever manatees with their internal barometers were anticipating the warmer weather by going out to eat or packing into the area near the river where they were ready to go out and eat. They should be back this weekend. Today we counted 324 manatees and ID’d 189 of those. Adoptees included Floyd, Nick, Philip, Paddy Doyle, Annie, Rocket, Moo Shoo, and Aqua and calf. Then, with the roll call over, Deep Dent and Howie came in. The river was down another degree to 58° F (14° C), and we counted 424 manatees — almost 100 more than yesterday. We ID’d 240 manatees. The Save the Manatee Club adoptees were Lily, Philip, Nick, Lucille, Lenny, Paddy Doyle, Una, Rocket, Whiskers, Phyllis and calf, Moo Shoo, Annie, and Aqua and calf. Now it will warm and then get cold for the Blue Spring Manatee Festival on January 26th and 27th. The river temp was down to 59° F (14.5° C). We counted 327 manatees. Among the 180 manatees we ID’d, we found the following Save the Manatee Club adoptees: Deep Dent, Lucille, Nick, Lenny, Doc, Philip, Una, Whiskers, Moo Shoo, and Gator. The river temp was 59.9° F (15° C). Comparing the river temps and the manatee counts for the past four days, I would say the river temps we were getting were very much affected by the temperature of the spring run. Our river temps for the past few days should have been much lower. Today we counted 340 manatees, which was 60 less than yesterday. The park count was also much lower. I ID’d 188 manatees and found the following Save the Manatee Club adoptees: Lily, Floyd, Lucille, Philip, Annie & calf, Howie, Gator, Moo Shoo, and Whiskers. The river temp continues at 63° C (17° C). The park staff counted 482 manatees, and we counted 399. The water was murky, and we were so concentrated on identification of the manatees that I was never happy with our count. I like the park count. We ID’d 227 manatees. The Save the Manatee Club adoptees we saw were Paddy Doyle, Lucille, Phyllis, Lily, Lenny, Annie, Una, Deep Dent, Howie, Nick, Doc, and Gator. Lucille has a new superficial boat strike of three propeller cuts on her right flank. The river temperature remained at 63° F (17° C), but the number of manatees increased by a bunch. We counted 366 manatees. When the count was over at least 28 more came in, so tomorrow should be quite a day. Of the 197 manatees ID’d, 12 were Save the Manatee Club adoptees. The adoptees were Phyllis, Una, Annie, Paddy Doyle, Deep Dent, Gator, Moo Shoo, Philip, Nick, and Howie. Philip, Nick, and Howie were late and missed roll call. We were doing a live stream on Facebook. We had just been asked if Nick was in and had just said no when I could say — there he is! The river temp was 63° F (17° C) today. The manatee count was up to 250. Of those, 108 were ID’d. The Save the Manatee Club adoptees in were Lily, Philip, Paddy Doyle, Doc, Una, and Lenny. I imagine we will be over 300 tomorrow! The river temp has risen to 66.7° F (17.5° C), and the count has dwindled to 102 manatees. Of those, 65 were ID’d and the Save the Manatee Club adoptees were Doc, Annie, Floyd, and Philip. Yesterday Cora saw Annie, Lily, Philip, Lenny, Paddy Doyle, Howie, Floyd, Doc, and Una. The river temp was 59° F (15° C). The count was 341 manatees. I promised more than four Save the Manatee Club adoptees, and they were there! We saw Howie, Paddy Doyle, Lily, Deep Dent, Floyd, Moo Shoo, Gator, Annie and calf, Aqua and calf, Phyllis, and Rocket. After the count was over, we ran across Una and Whiskers. They were probably there all along, but the wind was causing problems with IDs. Still the wind was better than yesterday. Do not be concerned that I did not mention Phyllis’ calf. The calf was not right by her side, but there were plenty scattered in the area, and I am sure one of them was hers. With the air temp in the thirties last night, the river went down to 60° F (15.5° C). We counted 143 manatees and more seemed to be coming in. It was hard to see with the wind blowing so hard. Today Lily was joined by Annie, Lucille, and Floyd. We should have many more Save the Manatee Club adoptees in tomorrow. The river went down another tenth of a degree, and the number of manatees in rose to 66. 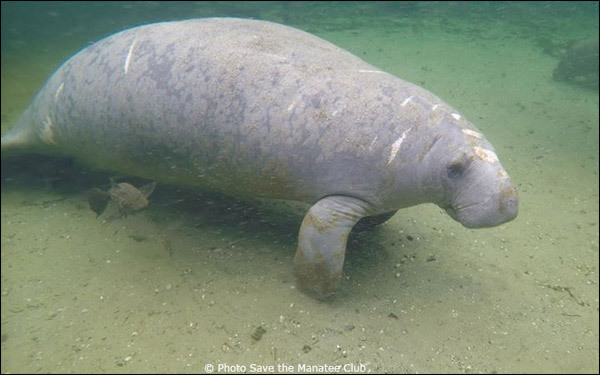 The lovely and very large Lily was our only Save the Manatee Club adoptee. The river temp went down a tenth of a degree, but the warm day yesterday caused the count to drop from 104 to 48 manatees with no Save the Manatee Club adoptees being seen at all. I do not expect much tomorrow, but the next three days may bring in quite a few manatees. The river temp was 67.9° F (19.9° C). I counted 104 manatees. Floyd was in for the count, and Howie showed up when the count was over. So at least two Save the Manatee Club adoptees were in. Cora got a river temp of 70° F (21° C) and counted seven manatees. None were Save the Manatee Club adoptees. On Monday, Cora and I counted 27 manatees with a river temp of 68° F (20° C). On Tuesday, Cora counted 15 manatees with the river temp unknown. Today, Wednesday, I counted five manatees with a river temp of 70° F (21° C). During those three days, 25 manatees were ID’d and none were Save the Manatee Club adoptees. It should be cooler this weekend, so we may have better luck next week. Cora did the weekend manatee counts. The river temp was steady at 65-7° F (18.5° C). The counts were 69 manatees on the 29th and 42 manatees on the 30th. Rocket was in on Sunday. He was the only Save the Manatee Club adoptee. On Sunday, Cora initiated a capture for a skinny orphan calf we had been concerned about. The capture by the Florida Fish and Wildlife Conservation Commission was successful, and the poor little girl certainly needed it. She is at SeaWorld now for care and treatment. On Wednesday, the river temp was way up from December 24th to 61.7° F (16.5° C), and the count was down to 309 manatees. The warmer temps made the manatees frisky, so the clay they were stirring up made seeing manatees hard, let alone identifying them. However, we did see Save the Manatee Club adoptees Floyd, Phyllis, Nick, Aqua and her calf, Annie, Margarito, Doc, and Paddy Doyle. On Thursday, the river temp remained the same, 61.7° F (16.5° C), but the number of manatees counted dropped from 309 to 274. Of those, 139 manatees were ID’d. The Save the Manatee Club adoptees in were Aqua, Floyd, and Doc. Going to have some warm weather now. What a day. The wind was down and we ID’d 279 manatees. The river temp was 55.4° F (13° C). The total count was 420 manatees. The park staff gave up as the mist off the run was so thick. At least six more manatees made their first appearance for this season. The Save the Manatee Club adoptees in were Howie, Una, Margarito, Lenny, Lucille, Whiskers, Philip, Floyd, Lily, Phyllis, Aqua, Annie, Moo Shoo, Doc, Deep Dent, Gator and Paddy Doyle. Among those I expected might show up, we only missed Nick and Rocket. The river temp was 61° F (16° C). We counted 371 manatees. The wind was not calm and increasing to 5 mph as predicted. It was more like 10 to 15 mph. Still, we managed to spot Save the Manatee Club adoptees Nick, Lenny, Floyd, Gator, Una, Moo Shoo, Doc, Annie, Whiskers, Lily, Phyllis, and Aqua. As we pulled the canoe in at the end of the count, Cora got a call to see if she could confirm a dead manatee report and, if true, possibly tow it in. Fortunately, a Florida Fish and Wildlife Conservation Commission officer was in the park and got the same call. He launched his boat, and we went on to retrieve BS831, Raja. Raja was a one or two-year-old male when he was ID’d in 2013. We have not heard back on a cause of death as of this writing. This makes eight dead manatees for the season ( I am fudging a bit and including the stillborn calf before the season started). Lately, we are averaging a dead manatee a week. We have never had such a depressing streak in my 39 years of research. As of now, we know the cause of death of only two. The river temperature dropped a bit to 15° C (59° F) degrees. Park staff counted 254 manatees, and I counted 316. Of those, 149 manatees were ID’d, among them Save the Manatee Club adoptees Nick, Rocket, Lucille, Lily, Philip, Annie with her calf, Una, Phyllis with her calf, Gator, Whiskers and Moo Shoo. Deep Dent, Floyd, and Paddy Doyle were late for roll call but still showed up all together as if they had planned on just being late together! Another manatee we were happy to see is “Freya,” who is not an adoptee, but a juvenile female who showed up with severe injuries from a boat propeller on Christmas Eve last year. Her wounds have completely healed now, but she is still identifiable. Today (Thursday, December 20th) the weather is very bad, so we didn’t do a count. The river temp was 60.8° F (16° C).Cora and I counted 309 manatees. Of those, 90 manatees were ID’d including adoptees Deep Dent, Rocket, Una, Nick Howie, Margarito, Annie, Lily, Doc, Gator, Floyd, Moo Shoo, and Phyllis. With the count almost finished, we received word a dead manatee was being brought in by the park staff. We ID’d the manatee as BS715 Cree, not an adoptee. Cree was given her ID in 2011. We last saw her on December 14th. Cree was accompanied this year by her second calf. The calf should be okay as it has already been filmed nursing on another mother, even though Cree was right there. Cree’s other calf was born in 2015 and is a female, so Cree’s line lives on. Cora got a count of 245 with a river temp of 62.8° F (17° C). She saw adoptees Rocket, Lucille, Annie and calf, Lily, Gator, Floyd, Una, and Doc. The river was a bit warmer, 60.8°F (16°C), and manatee numbers were down. We saw 262. In that number were Nick, Philip, Phyllis, Margarito, Una, Annie, Gator, Lily, and Doc. We saw Deep Dent, but he was late. On Friday, Cora counted 309 manatees as the river temp stayed at 60.5° F (15° C). Of those, 146 manatees were ID’d, including adoptees Deep Dent, Philip, Howie, Paddy Doyle, Lenny, Annie, Moo Shoo, Doc, Phyllis, Rocket, and Gator. Lucille made it in after the roll call was over. Here are a few updated numbers: 280 manatees are known to have returned from last season, and 13 are known to have returned from past seasons. We have confirmed 55 calves. There are 72 well-marked unknown manatees and 91 poorly-marked seasonal manatees. This all comes to a total of 511 manatees with more coming in. Last season we saw 585. The river temp was 60.5°F (15°C). Our count that should have been much higher than the past two day was “only” 394 manatees. I think we were distracted by the perfect conditions to ID manatees. We ID’d 252 of those. The adoptees were Lucille, Aqua, Margarito, Una, Howie, Nick, Philip, Annie, Deep Dent, Lily, Moo Shoo, Gator, Doc, and Phyllis. In addition, two non-adoptees we had not seen for a few years dropped in. Dade and Anvil have been spending the winters further north, but it was good to see them here. A dead manatee was recently recovered north of the State Road 44 bridge. The Florida Fish and Wildlife Conservation Commission will do a necropsy to determine the cause of death. Without the wind pushing the spring water around, the river temp was a more realistic 61.7° F (16.5°C). We counted 388 manatees, but it should have been about 60 more. The fog was so thick, we could only see a few feet around the canoe at the beginning of the count. Fortunately the fog lifted and allowed us to see Howie before we put the canoe up. Our other adoptee sightings were Paddy Doyle, Moo Shoo, Una, Philip, Rocket, Lenny, Floyd, Aqua, Whiskers, Deep Dent, Lily, Phyllis, Doc, and Annie with calf. Lucille also showed up, but, like Howie, she missed roll call. Everybody we could expect to see except Margarito and Gator. After five years, we also have Africa back. He is not an adoptee, but it was good to see him! The river temperature was 65.5°C (18.5°C), but it was definitely affected by the spring water being blown south by the wind. Even with the terrible wind, we counted 389 manatees. It was a bit of an estimate, but the park staff counted 354, so it must have been a good estimate! Only 160 manatees were ID’d, including adoptees Paddy Doyle, Floyd, Una, Aqua, Rocket, and Whiskers. We could have canceled with the wind, but the weather looks worse later in the week. The river was only down to 66°F (19°C), but we counted 237 manatees in high winds that made ID’s very difficult. We did ID 116 manatees and saw Moo Shoo, Rocket, Phyllis, and Aqua. A bonus was seeing one manatee we had been hoping for. Freya, not an adoptee, was back, and the terrible wounds she suffered last year are completely healed. Many manatees are still making their first visit for the season, so the excitement continues. I just added up my numbers again: 234 manatees have returned from last season, five manatees from previous seasons have returned, and there are 44 calves, 51 unknowns or heavily-scarred manatees, and 82 seasonals, or lightly-scarred manatees. This totals to 416 manatee so far this season. Not a bad start. Howie is the only adoptee I expect to see who has not been located somewhere else. The river dropped a degree and one half to 62° F (17° C), and I counted 305 manatees. Of these, I ID’d 207. It was the first calm day I’ve been out. Too sunny for good filming though. Deep Dent was the first manatee I ID’d. Later I saw Margarito, so those two have made their first appearance for the season! I also saw Philip, Nick, Floyd, Lily, Rocket, Una, Phyllis, and Doc. Paddy Doyle was not there at the start, but he came in during the count. Gator came in when the count was over. In addition, Brutus and Merlin have been sighted at a northern spring as reported by Monica Ross of Sea to Shore Alliance. Two manatees need line removed, and several manatees need retagging. We are also looking at a possible capture. The season is so exciting, but I can’t ignore the five deaths we have had at the season’s start: two calves, two young females, and yesterday, a young male was brought in. I just managed to ID it as Kala. He was probably no more than five years old. One of the females was a boat-related death, but the cause of death is unknown for the rest. The river was 64° F (17.5° C) today. I counted 280 manatees, which included Lucille, Nick, Philip, Una, Moo Shoo, Annie, Whiskers, and Phyllis. Nick and Whiskers were making their first visit for the season. Many non-adoptees made first appearances as well. In addition Flash appeared on Facebook in a film shot at a spring to our north. I hear there is no food to the north, so perhaps Flash, Brutus, and Merlin will be around more this season. The river temperature we got was 67° F (19.5° C). The wind was out of the north and that temp must have been effected by the spring run being blown south. The river had to be cooler than that. The wind is hard on us as we try to ID manatees through the ripples on the water. As soon as the wind from a cold front coming through calms down, the wind from the next warm front starts up and so on. Well, we counted 123 manatees and ID’d 56. We saw Annie and Rocket from the adoption program. The river warmed a degree, and the manatee count dropped from 106 to 86. Now it is due to cool for a bit again, and we look forward to many more new arrivals. Even with the warmer river temperature, manatees that we have not seen yet this season continue to come in. There were 16 new arrivals today. Doc was our sole adoptee, and he barely make it before we got off the water! Yesterday Cora Berchem, our Manatee Research & Multimedia Specialist, counted 194 manatees. Among them were Lily, Floyd, Gator, Doc, Philip, and Rocket. Today we had only Paddy Doyle in among 106 manatees. The river was 65° F (18° C) and rising. The manatees were packed just inside the run for the most part — waiting to get out in the river as it warmed. Here are some numbers for the season so far: 157 manatees have returned from last season, and five have returned from previous seasons. We have 26 live calves from identified mothers. The next two figures are a day old: 19 manatees are scarred enough to name and number, if not ID, and 12 have minor scars that will probably disappear by next season. This gives a total of 229 manatees. Cora has counted 298 manatees. What gives? That’s because we do total manatee counts, and we do identification based on their scars. Many manatees have been counted but with no chance to ID. The young and least scarred manatees come in first, and we can count them but not keep track of them. In addition, they are greeting friends that they have not seen all summer while they were scattered from the Carolinas to the Keys! In their enthusiasm, the manatees are stirring up the clay and bottom silt in the spring run. Add the wind, and many manatees can hardly be seen, let alone get ID’d! But it will settle down. The river temperature was 63° F (17° C) today, and luckily the wind had calmed down a bit. The park staff counted 206 manatees, and my count was 298. Of those, 98 of manatees were ID’d. The manatees were still busy stirring up the clay — playing and cavorting, which made identification very difficult, especially in the lower part of the run. Save the Manatee Club adoptees Lenny, Moo Shoo, Una, Annie, Lucille, Lily, Aqua, Phyllis, Gator, Doc, and Paddy Doyle were seen. It looks like Aqua may have a calf! Many of the calves are currently running around playing with each other while mom is resting, and it often hard to determine which calf belongs to which mother. A manatee that showed up at Blue Spring last December with significant scars turned out to be “RB654” — a manatee previously known from Riviera Beach. He only visited us at Blue Spring for a few days and then disappeared again, but today he was back! We are still seeing more manatees come in that we had not seen yet this season, which is exciting. Unfortunately, we also got the news that a carcass of a female manatee was recovered north of Blue Spring. Florida Fish and Wildlife Conservation Commission staff retrieved the carcass, which had no obvious scars on it, and we are awaiting the necropsy report. On Monday, Cora counted 17 manatees, and the park staff counted 15. The temp in the St. Johns River was 68° F (20° C). Of those, 10 manatees were identified, but none of them were Save the Manatee Club adoptees. On Tuesday, we counted 36 manatees, and the park staff counted 41. The river temp was 69° F (20.5° C). Annie was the only Save the Manatee Club adoptee, and she was in with her calf. Buckeye, a manatee previously rescued and released, had lost his tag, which was recovered by an employee from the St John’s River Cruises by the kayak/canoe launch at the park. We notified Sea to Shore Alliance staff, who are tracking Buckeye for the Manatee Rehabilitation Partnership. It was very windy, which made the count difficult. Many manatees were seen actively cavorting around the tour boats and in the river throughout the entire day. On Wednesday the 28th, Cora counted 195 manatees, and the park staff counted 104. The river temperature had dropped to 65° F (18.5° C). It was still very windy, which made counting and identification hard. On top of that, many manatees actively cavorted both in the lower part of the run as well as in the “swimming area,” and the water was very stirred up. Of those counted, 85 manatees were identified, including Save the Manatee Club adoptees Lucille, Lily, Gator, Annie with her calf, Una, Floyd, Moo Shoo, and Phyllis with her calf. It was great to see Una, who had been released last December after being rehabilitated at SeaWorld Orlando for entanglement in monofilament fishing line. Una looked good, but unfortunately she did have a new entanglement on her right flipper. The Florida Fish and Wildlife Conservation Commission was notified, and photos will be sent out. Trevluc, another manatee who is being monitored by researchers from Sea to Shore Alliance, was also seen today. He was still wearing his tracking belt, but there was no tag. Sea to Shore staff was notified. With the cool temperatures, we are expecting to see many manatees over the next few days and hopefully more adoptees! Cora Berchem, our Manatee Researcher & Multimedia Specialist, counted 37 manatees, and the park staff counted 44. The river temp was 68° F (20° C). We might have expected more, but the manatees know it is warming up. Of those counted, 19 manatees were ID’d, but none were adoptees. Cora saw a great deal of cavorting in the river. There is rain and wind in the forecast, so counts will be difficult to impossible for a few days. Bulletin: When Cora Berchem, our Manatee Researcher & Multimedia Specialist, reviewed the webcam film for the weekend, she found Lily and Floyd had come in. So with Gator, we have three adoptees for the season so far! The river was 68° F (20° C) today, and Cora and I counted 20 manatees for the official count and then 11 more came in after the count. Twenty of the 31 manatees were ID’d, including Gator. The weather was a little cooler than I thought it would be, but it did not help. The river temp was 70° F (21° C) and only 15 manatees were in. Eleven manatees were ID’d but none were adoptees. It rained, and I got soaked. The raincoat in the car did me no good in the canoe. We have seen 47 manatees since the start of the season four days ago, and 13 of these are calves. We also have five more calves we have seen recently, but not since the season started. Well, it is to be cooler by the end of November. I’m looking forward to it! Cora Berchem, our Manatee Researcher & Multimedia Specialist, and I took roll call today and counted at least 39 manatees. Yesterday Cora counted 61 and the day before the park staff counted 47. That means the manatee season at Blue Spring State Park in Volusia County began on Saturday, November 17, 2018. There appears to be no cool weather in the outlook until next Monday, so manatee attendance may go right back down. Twenty-five of the 39 manates were ID’d today, but there were no adoptees. However Cora did see Gator yesterday, so we have at least one adoptee back! We will be keeping an eye out the next two days leading into the holiday. Cora Berchem, Manatee Researcher & Multimedia Specialist, and I did a rehearsal of a manatee count in October, and now it is November! I should have done a rehearsal of the blog as well. The river temperatures have been in the low 70s Fahrenheit (low 20s Celsius) at Racy Point in Putnam County, near Palatka, Florida. Racy Point is 60-some miles north, so the temps are more like mid-70s at Blue Spring. Manatees have been dropping by to check the spring out. Most do not stay long, but we needed to be sure we were ready for the season. We took the river temp, which was 72.6° F (22.5° C) — basically the same as the spring run. 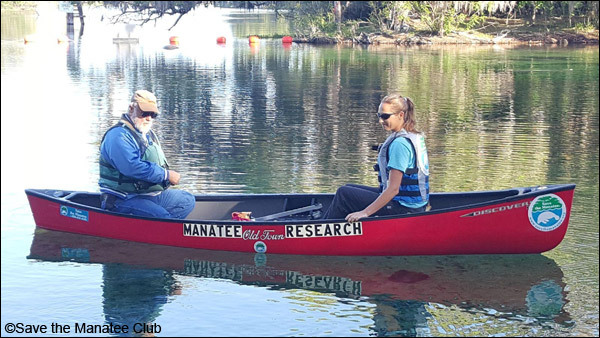 On October 28th, the canoe was fine; on the 29th buzzards had removed five letters of the stickers spelling “manatee research.” We put on new letters and unlocked the canoe. The locks worked beautifully. Normally they are rusted up after the summer, and I have to oil them and beat them with a hammer to get them open and working. The canoe was high up the bank to escape the rising St Johns River, but as the rain had been to the north in the latter part of the rainy season, we could move it down to a more convenient place to launch. Last season we secured the canoe to the steps and left it afloat hoping it would not rain before the water receded. We checked out some manatees and headed up the run to see if the posts with metal numbers marking the transects (they help us locate the manatees on our maps) had survived the swim season, and they had! Back to the manatees: the count was seven and although no adoptees were in, five could be ID’d. We were excited to see Brooke with a new calf. That makes eight live calves for the year with the season not even underway! On November 4th, the river temp was 70° F (21.2° C) at Racy Point today — two degrees Fahrenheit above the magic number to get the season started. It will be warmer at Blue Spring. We get one day of manatee temperatures (low 50s, low 70s) for six days in the upper 60s and mid-80s. Right now it looks as if the season will start sometime in the last two weeks of November. We are so looking forward to it! !